Organizations are like icebergs. The formal aspects of organization, roles, hierarchy, signing authority, rules, etc., are the 2/5 above the water line. 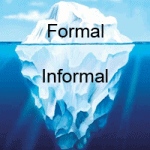 The 3/5 below the waterline is where the real work gets done through informal relationships supported by implicit norms and culture. Just as drunks are prone to look for their lost keys under a lamp post because that’s where the light is, most performance improvement efforts have focused on the formal 2/5 because it’s visible and far easier to describe, document and manipulate. Efforts to improve elements below the waterline such as organization culture have always been episodic, hard to describe and difficult to measure results. Enter social networking. Be it a passing phenomena (I don’t think so) or distraction (ditto), we have the equivalent of the first organization aqua-lung. Rather than a campaign, tools such as Facebook, Twitter and Yammer (similar, but tuned for business), provide tools for making persistent and tangible connections below the water line. They accelerate and extend informal dialogues by reducing the friction of informal relationships. Informal communication no longer depends on physical proximity. A tweet for help in Best Buy, extends to every associate in an instant. Nor are you bound to your desk since any Internet connected device can access these tools. Social networking makes it easy to cut across formal organization barriers (helpful or otherwise) such as hierarchy, specialties, functions or geographies. They remove the impediment of needing to know who to call for help as one can broadcast a request. The cooperative nature of personal relationships networks helps steer unguided requests to known experts. One of the potentials yet to be broadly harnessed is the data about implicit connections, reputation and knowledge assets. A few companies such as Procter and Gamble have used social network mapping to see who gets called upon most frequently in the informal organization to help with specific issues. Imagine if we mapped who people call on below the waterline to get their work done with the formal structure above the waterline? Would there be congruence? Or should there be? Perhaps having a complementary approach is a more productive balance? I don’t know the answer but the data would surely help our understanding of how work really gets done. Now add in the potential understanding to be gained about how extended relationships such as customers, supply chain and partners actually work. It could transform “ecosystem” from a buzz word to insightful understanding. The opportunity of social networking brings us face-to-face with a challenge that’s as old as organizations themselves: Control and its cohort, access to information. Politely stated, the raison d’être for hierarchy is to create order out of chaos. It rests on the assumption that without an external hand, people will not align their efforts. Worst case assumptions go back to McGregor’s Theory X and Y model where X declares that people are lazy and untrustworthy versus Y which argues they are honorable and want to do a good job. Unleashing social networking in your organization has several parallels to bringing democracy to a previously totalitarian regime. Will citizens have the maturity to manage their freedoms or must the state continue to exercise control? Managers vastly over rate their ability to control others and the value it brings. I remember my naivety when I took my first executive assignment. I imagined I would be driving a hot muscle car with one of those beefy silver Hurst gear shifts coming up to meet my right hand. If I jammed it into first, all you’d see would be two black streaks of steaming rubber. I learned instantly that the shifter was there alright, but it wasn’t connected to anything. As any young leader finds out the first week, ordering and mandating accomplishes little and costs a lot. Still, our mental models of the value of control are as outdated as our animalistic instincts. Just as saber tooth tigers no longer threaten us, our workforce capabilities, technology and industrial experience all combine to present a far different situation than Henry Ford found when he brought Michigan farmers into Detroit factories. Each succeeding generation comes to work with a higher level of base understanding of what it takes to win. In a knowledge economy, this raises the competitive challenge such that only those firms which can unleash then next generation’s thinking are likely to succeed over time. For years, we have used language such as “participatory management” or “empowerment” that frankly signaled intent more than they delivered substantially different work practices. Part of what held these good intentions in check was that while targeted at the relationships under the waterline, they operated on the 2/5 above it. They tried to formalize better informal interpersonal interactions. That’s a classic Catch-22 writ large. The potential of social networking is that it thrives below the waterline. Harnessing the potential of social networking requires updating our control assumptions. Social networking provides a tool that can map today’s intelligent workforce’s footprints to see where they go on their own. It enables us to follow the energy flow and therefore, when direction changes are necessary, make them more insightfully. It will also provide more evidence to trust as well as verify trust already extended. That’s a step towards a smarter model of control. I am very impressed with the article I have just read. I wish the author of http://www.workingwider.com can continue to provide so much productive information and unforgettable experience to http://www.workingwider.com readers. There is not much to say except the following universal truth: Government workers and transit employees move very slowly I will be back. very informative post and great post as usual!thanks for sharing.